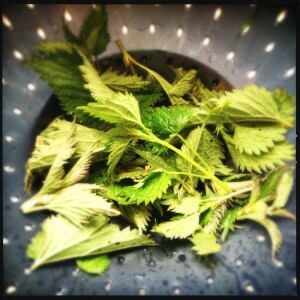 Here is a quick and simple recipe for nettle soup. In fact it is surprisingly tasty. If you like vegetable soup – this tastes just the same. First you need to collect the nettles. Just get the tips of young plants. You don’t want any old hairy monsters, or ones in bloom. In your foraging bag you should get about about six good handfuls. Make sure you are wearing gloves or you will be searching for dock leaves for the next few hours. 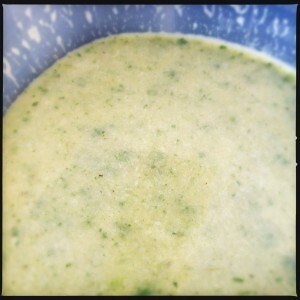 This is a good recipe to make with the kids after a May walk, and also gets them over their fear of nettles. Yes they do sting but if you have your body covered you will be ok.
After collecting your nettles, get rid of any stems or stalks and just go for the leaves. 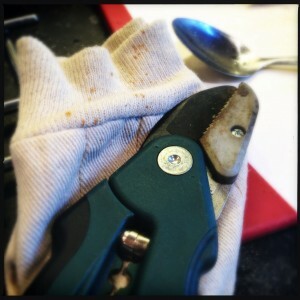 Give them a really good wash and set aside. 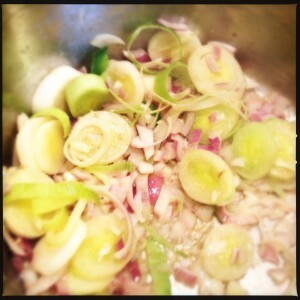 Melt the butter then add the the leaks, onions, garlic and celery salt. Simmer on a medium heat until they are starting to turn golden (about 7 minutes). Throw in the rice and stir until it is covered with the butter, then pour in the stock. 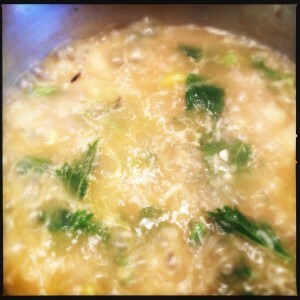 Simmer for about ten minutes, then add the nettles. They will cook after about 4 minutes. Take off the heat and use a blender in small batches to whiz the ingredients together. Season with salt and pepper. If you want you can top with sour cream to make a smiley face. We did a blind taste with this recipe. The surprising verdict was the kids loved it – for them revenge was sweet for all those stung legs. However the grandparents were very reticent to eat a stinging weed, but after getting over the initial fear factor they loved it too.